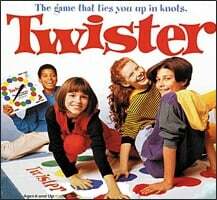 When Twister debuted in 1966, the party game was hardly an instant hit. Retailers thought the human-pretzel game too risqué, and orders were so slow that Milton Bradley was due to stop production. That is, until one memorable appearance on The Tonight Show with Johnny Carson rescued Twister from the scrap heap and turned it into a pop-culture sensation. In 1966, Minnesota ad man Reyn Guyer imagined a game that was played, not on a table, but on the floor. He wanted to use the players as the game pieces and have them invade each others personal space while having the time of their lives. Guyer hired industry veteran Charles Foley and artist Neil Rabens to help him refine the concept. Rabens came up with the idea of having players place their hands as well as their feet on the game board, while Foley thought of putting six circles of the same color in four rows so that players would become entangled. 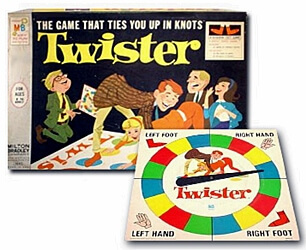 By the end of 1967, three million Twister games had been sold, and it became one of the decade’s most popular games. By 1986 the box cover changed to reflect the target market.